A Resurgence of Wildlife in Northern Tibet Biologist George Schaller is the first to survey wildlife in Tibet's remote Chang Tang reserve in the winter. Schaller spoke with Alex Chadwick about some surprising findings from his 1,000-mile journey. 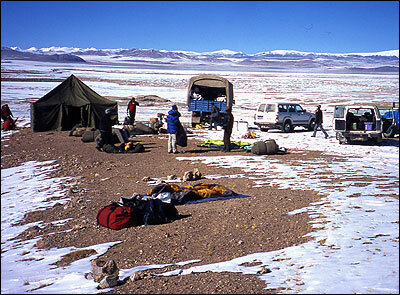 Biologist George Schaller in Tibet's Chang Tang reserve. He is the first explorer in more than a century to traverse the remote, uninhabited terrain. 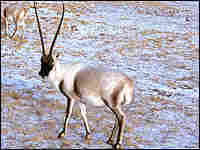 The Tibetan antelope, or chiru. Once aggressively poached for its fine wool, increased enforcement and conservation has helped revive the endangered species. Schaller and his team counted 9,000 chiru during their expedition in the Chang Tang reserve. Schaller's team is the first to traverse the uninhabited region in the winter. "It didn't get to 40 below," says Schaller, "I've been up there when it's 40 below. It got to 25 below zero only. But it's still uncomfortable." 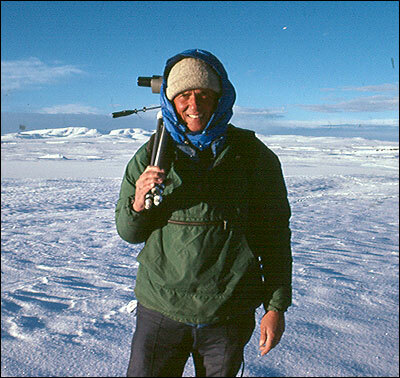 Explorer and biologist George Schaller has studied species across the world. Now he's focusing on Asia and the protection of a Tibetan antelope, the chiru. In the 1990s chiru were poached by the tens of thousands; their fine wool was woven to make expensive shawls. Now, China's efforts to stop the poaching appear to be paying off. On a recent expedition to the chiru's habitat, Schaller found that the antelopes are making a comeback. With backing from the Wildlife Conservation Society and the National Geographic Society's Expeditions Council, Schaller set off last fall on a 1,000-mile expedition. Here, he talks about his journey across a high Tibetan plateau in a region known as the Chang Tang. George Schaller: "Chang Tang" means northern plain in Tibetan, and most of it lies in northern Tibet and extends eastward into Qinghai province and a little bit north into Xinjiang province. It's a huge area — it's over 200,000 square miles — and the thing that intrigues me is that most of it is uninhabited, and most of it has never been surveyed for wildlife. I've made many expeditions into the area, mostly in summer, but the big question to me was, What's there in winter? Have the animals moved out? 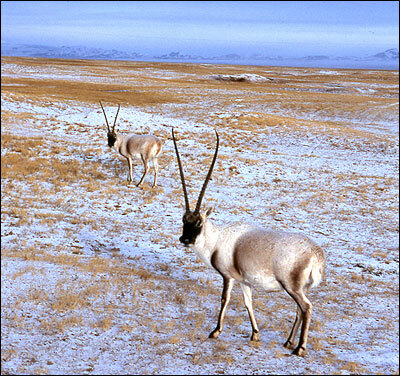 We know that the Tibetan antelope, or chiru, moves north to have calves, and then moves south again. But what's up there in winter? It's not a place that's particularly comfortable. The whole area is 16,000 feet [above sea level]. You have these high rolling hills, and plains interspersed by mountains over 20,000 feet high, so we decided to do a traverse of the whole area, west to east. 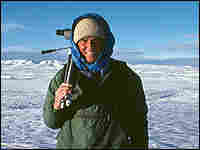 Alex Chadwick: There is one record of explorers having done this before, but it was back in 1896. A couple of British officers went by horseback — they went in the summer, though. There's no record of anyone ever having tried to do this in the winter. GS: That is perfectly true. As you said, there was Welby and Malcum, two British officers, they rode horses and mules across. It took them, naturally, several months. It took us two months. But think of it this way. Here we went 750 miles cross-country, without roads, not a single person living there. Nobody lives there because it's too high for livestock, but wildlife manages to be there: the Tibetan antelope, or chiru, wild yak, wild asses, big-horned argali sheep, wolves — we saw quite a few wolves. And so you have this wildlife treasure hidden away in China, which nobody knows much about, still. AC: So you're gathering data, counting the numbers of animals that you see. You have a team of more than a dozen Chinese and Tibetan researchers and conservationists who are with you, and you're all driving all this way. GS: What I'm very, very happy about is, for most of the trip, we had 10 Tibetans, everything from camp helper to conservationists. I had a couple of young Chinese researchers, and I was the lone foreigner. We had a wonderful congenial team, and that makes a big difference when the climate is harsh and uncomfortable. AC: But when you're traveling and it's 25-40 below zero at night, where are you sleeping? GS: In tents, it's just chilly. It didn't get to 40 below — I've been up there when it's 40 below. It got to 25 below zero only. But it's still uncomfortable. AC: It sounds uncomfortable, for two months. GS: Once we got to nomad areas, we sometimes slept with nomads. AC: So this region on this map, it doesn't look all that smooth, George. It looks like it's ridged. I see these dark lines, I see a lot of lakes, and it doesn't look like it would be that easy to cross. GS: Well, that's what makes it challenging, why it doesn't get done very often. I've been up there in the summers: It's extremely wet and the cars constantly get bogged down. The winter [is a] lot easier because things are frozen, except certain lakes. And we have to hunt for a route around, or through, mountains. GS: We sometimes spent a day not knowing where we were going, until we found a way out that trucks can do. AC: But it is a place where you can cross 750 miles of wild land and not encounter anyone? AC: How many places in the world do you think are left like that? 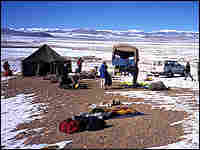 GS: You probably can find some places in the Sahara, but then on the other hand there's not much wildlife there, either. Here, you still have wild asses. In the eastern part, where there's better grazing, you have gazelles, so China realizes that it has a natural treasure there, and they're trying to protect it. And I may mention that that whole area in Tibet is the Chang Tang reserve, which is about 130,000 square miles, one of the largest reserves in the world. AC: So, here you are, trying to discover what kinds of wildlife could endure on this great, high, very cold plain in winter and whether there are wildlife populations there. And what do you find? GS: Well, you want to know what is there in the winter, because we've counted animals in the southern part where there are nomads. We've counted them up in that region in the summer, but how many stay there? Some animals, like the chiru, which became world-famous because of its fine wool, were being shot by the tens of thousands during the 1990s, and they're still being hunted for the fine wool. But thanks to the Chinese government, there are patrols out to stop the poaching. AC: So China must have been interested in having you make this traverse and gather this data. And you find something else when you're up there, because in the eastern part of this trip you do start to encounter some human communities. GS: In the eastern part, we came onto nomad communities, and what surprised and delighted me is that these communities all on their own have decided, "Well, our range lands are changing, they don't support as much livestock as they used to, so we should protect some of it." Besides, the Buddhist government tells people to show passion and reverence towards all living beings. So suddenly some of these communities have set up conservation organizations, they have set aside good chunks of land to preserve wild yak, which are getting very rare, to preserve Tibetan antelope, by simply saying, "OK, no grazing in this area of livestock, nobody settles in that." AC: How does that kind of conservation ethic grow up in these communities? Because we think of that as something that comes about after a lot of teaching and education, and I don't think you have a sense that it grows up in these rural communities spontaneously. GS: They're not that isolated. No. 1, they have their religion, and so they're predisposed towards that. No. 2, local people are aware of what's happening to their environment and they get worried about their own future, and some of the people particularly like to see wildlife around. It's part of their tradition. So, this is something that I think we need to encourage, promote, [and] sustain, and... let the communities do their thing, but encourage them to continue doing it. So on this trip we had a lot of household interviews to find out about what concerns them, how much income they make, what they think of the range land. AC: These nomads, you would go into their tents and sit and talk to them for a couple of hours? GS: Tibetan nomads are tremendously hospitable. You're invited in and you get your yogurt and your tea, and maybe some boiled mutton, and you sit and talk. And they're very open about the issues. And we had community meetings. A lot of people got together to [discuss] what needs to be done, what should be done, how things [were] different 25 years ago than now, and in general get their impressions of the situation. AC: So, George, you've come back. What are you going to do with this data? You've gathered figures on various populations of wildlife along the way. What are you going do now? GS: I've already given the basic information to the government departments concerned in Tibet and in Qinghai and we've made suggestions. One can pinpoint problems and what research needs to be done in all these areas. We made suggestions and they followed, but the real goal, really, is to have a certain harmony between the wildlife, the rangelands, the livestock and the people, and it can be achieved. We're planning — with the help of the National Geographic — to go have some environmental training courses in the region next year. George Shaller of the Wildlife Conservation Society, back from an expedition in Western China, the Tibetan plateau, the Chang Tang reserve. Schaller's journey was co-funded by the Wildlife Conservation Society and National Geographic's Expeditions Council. The National Geographic Expeditions Council is a grant program dedicated to funding exploration of largely unrecorded or little-known areas of the Earth, as well as regions undergoing significant environmental or cultural change. Since its inception in 1998, the Expeditions Council has funded projects that span the entire spectrum of exploration and adventure. Through the great stories these projects generate, National Geographic hopes to foster a deeper understanding of the world and its inhabitants.